I just got back from a ski vacation to Northstar in Tahoe. It was a great trip. 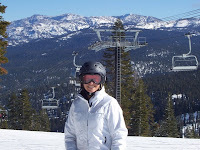 I flew into Reno and caught a shuttle on North Tahoe Express for about a 40 minute easy ride to the mountain of Northstar. I got settled in my condo and then went to dinner at The Village at Baxter's. The dinner was very good and I loved the atmosphere of the restaurant. The village has some very nice shops and restaurants. Tuesday I got up and went skiing. It was a bluebird day and the skiing conditions were great. I like Northstar as it had many long groomed trails. The views were gorgeous and it was not crowded. Northstar reminded me of a smaller version of Beaver Creek. Northstar is a family friendly resort as it is quiet and easy to get to with easy access to dining and shops. I would not recommend Northstar for those looking to stay out late and party as the shuttle stops at 10 p.m. and the restaurants close at that time as well. I enjoyed my time in Northstar and hope to go back soon. If you are interested or have any questions contact me at Lilly@snowventures.com or 1-800-845-7157 ext. 305.